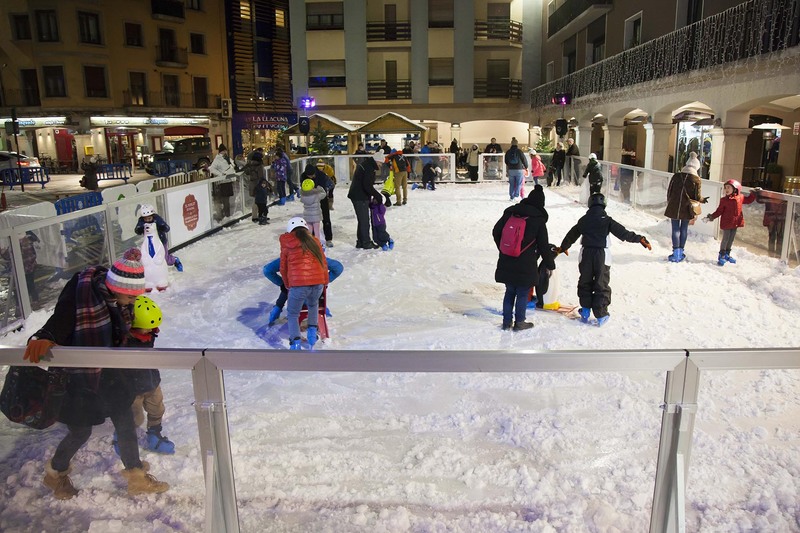 From 1 until 30 December, you and your family can make the most of our ice rink. 100 square metres of fun await! From Monday to Thursday: from 5 to 8 p.m.
Friday: from 5 to 9 p.m.
Saturdays and days 6, 7, 24, 26, 27 and 28: from 11 a.m. to 2 p.m. and from 3.30 p.m. to 9 p.m.
Sundays: from 11 a.m. to 2 p.m. and from 3.30 p.m. to 7 p.m. Opening hours are subject to change due to weather and safety conditions. The organisation will provide skates and a helmet, which must be returned at the end of the activity. Users are advised to wear gloves. Each participant may skate for 10–15 minutes, depending on the number of users waiting. Users may not walk wearing skates outside of the areas protected with rubber. Older users must be careful of younger users at all times. Andorra la Vella City Council accepts no responsibility for misuse of the facilities.